The Narrows is the centerpiece of Zion National Park. The mystery of sun rays filtering through the constricted slot canyons of the Narrows captivate visitors like few other natural wonders. The surreal photographs of the Narrow ultimately inspired us to embark on our first ever backpacking trip, despite its length, logistical complexity, danger, and technical elements. The top-down Narrows trail is not a beginning backpacker’s route, but it is very possible for first timers to enjoy and safely complete, especially after reading this guide! The award is unforgettable vistas, numerous adventures to share with others, and a tremendous sense of accomplishment. 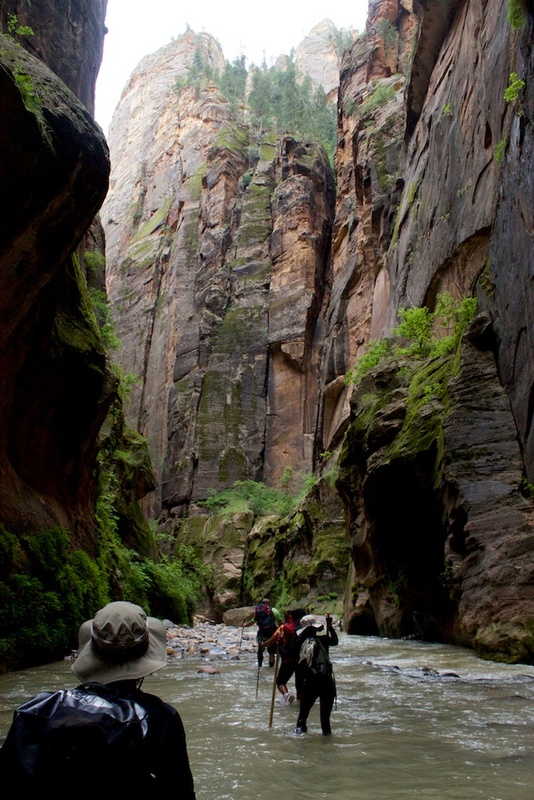 Deciding when to visit Zion National Park to backpack the Narrows is tricky. The National Park Service will not issue backpacking permits unless the flow rate of the Virgin River North Fork is below 120 cubic feet per second. On average, spring runoff keeps flow rates above this level into May. In the summer, starting in July, the risk of flash floods picks-up. And after this risk subsides in late September, water temperatures have dropped to the point where wetsuits are recommended. The graph below, constructed using historical USGS river data and NOAA temperature data, presents these trade-offs throughout the year. We decided to go on the July 4 weekend, just after flow rates have dropped and water temperatures have risen, but before flash flood risk picks-up. Unfortunately, we had to endure high daily temperatures, but the water and the shade in the canyon generally kept us cool. Graph Details: Flow rates are measured for the North Fork of the Virgin River, and represent average values going back to 1963 (data source: USGS). 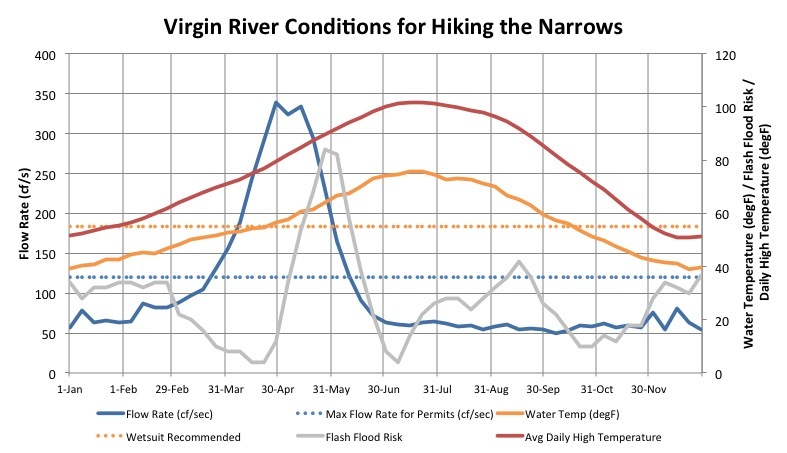 Water temperatures are measured downstream in Virgin, UT, and are likely several degrees warmer than the water temperature in the Narrows (data source: USGS). Flash flood risk is constructed by tracking the number of days where > 500% average flow was observed historically by week. Average daily high temperatures are measured in St. George, UT (data source: NOAA) and are likely 10 degrees or so warmer than what would be experienced in the Narrows. 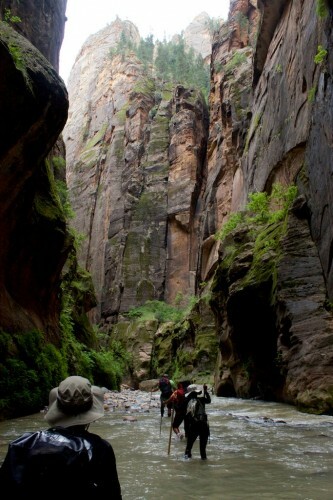 The National Park Service only allows twelve groups of backpackers to stay in the Narrows each night. Prospective hikers have two options: commit two months ahead of time and try and reserve one of six campsites online or try your luck to get one of the other six campsites made available the day before at the Zion Canyon Wilderness Desk. We opted for the former, and logged-in to the Wilderness Reservation System the minute reservations became available for July at 10am MDT on May 5 (see complete calendar). We sweated for fifteen long minutes as the successive confirmation pages took forever to load. Our patience paid off (we didn’t act on our temptation to refresh), and we were rewarded with a reservation for a campsite (#9) and hiking date of choice. I don’t believe there would have been any time for considering our choices, so I recommend researching the campgrounds on the Zion National Park website first and being ready to act as soon as reservations become available at 10am. Make sure the campground you select can accommodate your group size. Also note that you will be the only one at a particular campsite. The National Park Service does not combine groups at campsites, so even if you reserve a campsite with room for twelve, and you only have two people, you’ll have the campsite to yourselves. During the hike, we ran into a couple of groups that obtained their permits the day before the Wilderness Desk. The Wilderness Desk does not open until 7am (8am in Winter), but the groups we talked to were waiting outside before 5am. I can’t guarantee that arriving at 5am will guarantee you one of the six spots available, but it’s a data point. In addition to the backpacking permit, the other logistical item that must be addressed beforehand is transportation to the trailhead. The Narrows Top-Down hike begins at Chamberlin’s Ranch, which is 32 miles from Springdale, over half of which are on slow, winding dirt roads (trip time is about 90 minutes). There is limited parking at the trailhead that would allow a group with multiple vehicles to park overnight and return the next day, but we opted to pay for a ride through Zion Adventure Company. They offer daily shuttles arriving at the trailhead at 7:45am or 11:00am for $37/person. As discussed later on, with the amount of time it takes to traverse the Narrows, we were glad we took the earlier option, even though we were staying overnight. There are other outfits that offer shuttles, but it is definitely a good idea to book early, because you’ll be competing with both backpackers and people attempting to do the Top-Down hike in one day. Backpack: Our friend let us borrow 2 backpacks with about 4500 cubic inches of space. 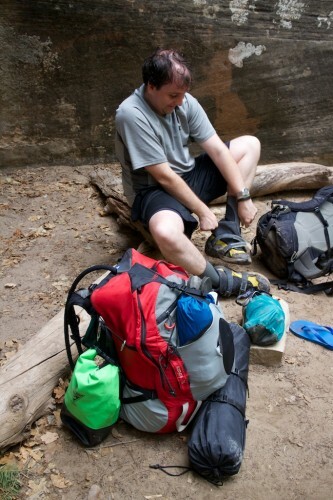 As a novice packer, we needed every spare cubic inch of that space for our equipment. Both backpacks were also equipped with a Camelback-style water storage system. On the second day of the hike, we received the tip that the backpacks should be tightened so that they stay high up on your back. We wished we would have known this early, as we found our backs were far less sore on the second day. Tent: A small 2-person backpackers tent was a good compromise between comfort and weight and space requirements in our packs. Sleeping Bags: We brought two synthetic sleeping bags also borrowed from a friend. Synthetic was a good choice, instead of wool, because if they did get wet, it would be far less devastating. We also didn’t need the superior insulation qualities of wool in July. Along with the sleeping bags, we brought two lightweight sleeping pads we strapped to the back of our backs to provide a bit of padding on the hard ground. Shoes & Socks: We rented the warm water package from Zion Adventure Company that included neoprene socks, Cannoneer-2 water shoes, and a hiking pole for $35 for the two day hike. The shoes provide great traction and are probably reasonably comfortable considering all the rock hopping we did in them. However, my wife was disappointed that they are not particularly stylish. The neoprene socks did keep our feet dry and warm, and were not too uncomfortable. Dry Sacks: We bought dry sacks in a variety of sizes for our hike to keep our equipment dry, including two bags large enough to contain our sleeping bag (20 liter), and small ones for our camera and phones (3 liter). These proved essential, as we went through several chest deep areas and would have had to live with wet sleeping bags or malfunctioning electronics without the protection. Sustenance: For the one night, we decided to survive on cold food instead of packing a stove. Beef jerky, dried fruit, granola bars, cheeze-its, and turkey sandwiches provided plenty of variety and were easy to pack and carry. We also brought along a water filter to re-fill our camelbacks. We passed another group that was using a UV light, but they mentioned it isn’t effective if the water isn’t clear (which it wasn’t on our first day). To our distress, we found ourselves quickly running increasingly behind the time guidance after we entered the water, even though we were outpacing other hikers. This especially proved unnerving after lunch when it began to rain and we heard thunder, potentially indicating a risk for flash floods. We believe a big reason for our slow pace is that at first, we spent a lot of time hiking in the water. We later discovered that trails have been cleared along most of the route, and that there are only small portions of the river that need to be transversed directly. Traveling in the river is generally slower, due to unexpected rocks and occasionally strong currents. In retrospect, we wished we would have not stressed too much about keeping to the official timeline, and took more time to enjoy the scenery. 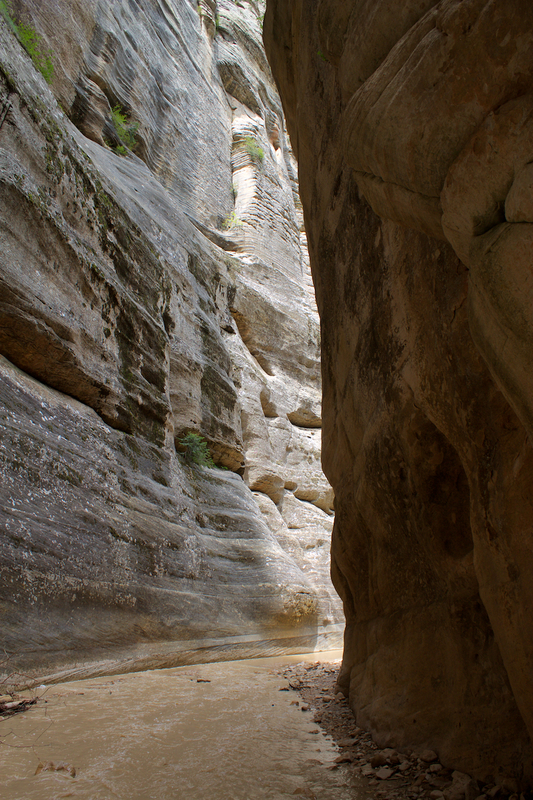 The Upper Narrows (see snapshot bellow) between Bullock’s Cabin and the waterfall offer views that rival those in Wall Street (the famous narrows closer to Zion Canyon), but with complete solitude. It is really a spiritual experience. Despite our back aches from our heavy packs, we were very pleased we opted to stay overnight. Our feet were extremely sore by the time we reached campsite #9 and I couldn’t imagine going much further. We were also very happy we started on the early shuttle, as it was already 3:45pm. With just enough energy to change into more comfortable camp clothing and eat our packed supper, we went to bed fairly early. By the time we reached Wall Street, which starts just beyond Big Spring, we did start seeing day hikers. Luckily, even with our late start, the crowds were pretty thin until we reached Orderville Canyon. After Orderville Canyon, however, it became a zoo. The crowds really tainted the experience, and probably sped us up to get the hike over as soon as possible. We would definitely recommend getting an earlier start to avoid this experience. We were extremely thankful that the last mile of the hike was paved. We actually found ourselves walking very quickly and passing the day hikers. Walking on level ground just seemed so easy after the rock hopping we had been doing for most of the last two days. After getting to the trailhead, we were able to get on the second shuttle departure and recuperate back in Springdale. We arrived safe and extremely tired, but very proud of what we had achieved! This entry was posted in Outdoor Adventures, Travel, Weekend Getaway and tagged hiking, United States, Utah, Zion 2015 Trip by Ryan. Bookmark the permalink.